Authentic equipment of Japans legendary military class, modelled in 1:2 scale. The classic suits of armour worn by Japans famed samurai warriors evolved over more than a thousand years to reach a peak of artistry and sophistication. 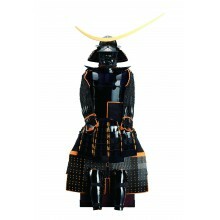 Order your Samurai full kit online today and receive everything in one shipment. Comes complete with a fascinating magazine giving you the history of Japan and its legendary samurai warriors along with your detailed Assembly Guide.